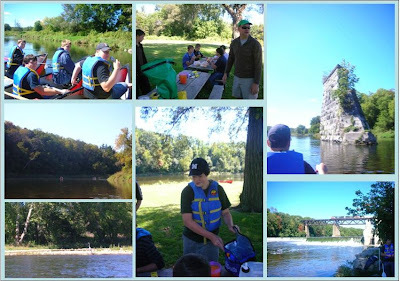 The 433rd Venturers first outing of the season was a one night camp and canoe outing on the Grand River. Provisioned by Grand Experiences, we embarked on a leisurely 24 km trip known as the Tuscarora run from Glen Morris to Paris and finally to the Brant Conservation Area. On route, the company honored International Talk Like A Pirate Day (arrr, avast, and shiver me timbers too), guarded a wedding site (no plunderin lads) for our good turn, and enjoyed snacks, lunch, and awesome comradeship. Please checkout our main web site for registration and event updates for the 2009-2010 season! More updates will be coming throughout the season.